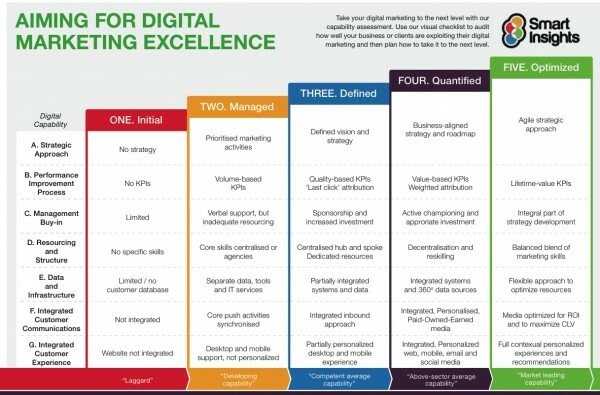 Is Your Business Making the Full Digital Impact? Although the web reached the grand old age of 25 years in 2014 many businesses have still not adapted to make the changes needed to fully integrate it into their business. The research report I presented at the Technology for Marketing conference earlier in the year - and have written up in this free research report on Managing Digital Marketing - clearly shows how many businesses are struggling to achieve integrated, optimised digital marketing. I’m not saying integrating digital marketing is easy - far from it. It’s a moving target; new access platforms like smartphone and tablet need new approaches to building customer experiences while updates to social networks require and Google’s platforms need constant vigilance and reviews of new ways of reaching and interacting with audiences. 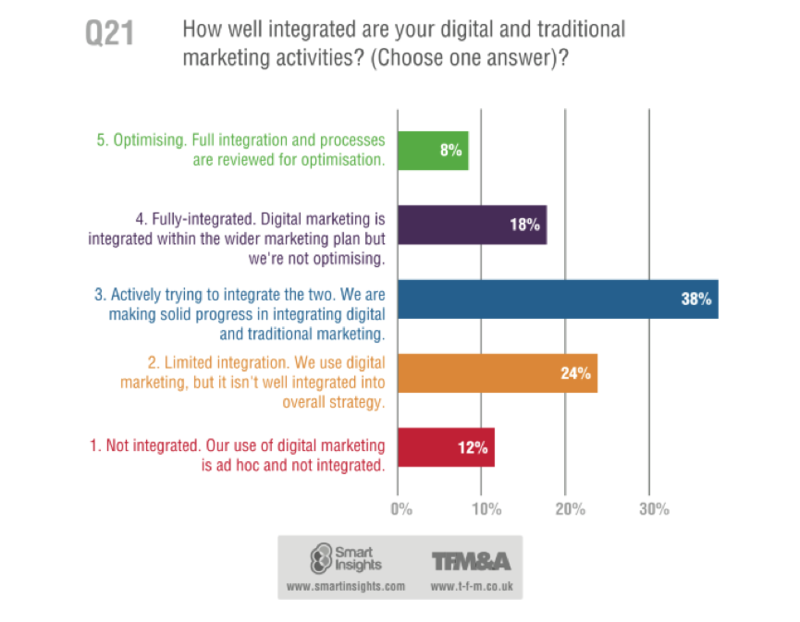 Another reason for the limited integration relates to the complex organisational changes required to fully integrate digital marketing. This includes structural changes to the marketing team with new roles that are more focused on digital marketing plus re-skilling marketers familiar with using traditional communications. Responsibility for digital marketing. Digital touches different areas in businesses, so whose responsibility is it? Skills and understanding. New skills and understanding are needed across all levels. Senior people in some cases, are suffering from ‘fear of the unknown and ‘are in denial about the change, viewing social platforms as a ‘fad’ or unimportant. Lack of integrated digital strategy and roadmap. The business is in fire-fighting reactive mode, dealing with issues as they occur, without a real strategy in place. Agency use. New competences are required from agencies who can build the right type of digital experiences and gain awareness for a brand through content marketing. These are just some of the challenges that need to be resolved as part of a successful digital transformation. A fuller picture is provided by this capability review developed by Smart Insights. I recommend that for all aspects of digital marketing - from top-level strategy like this through to managing key techniques like SEO, content marketing and email marketing - it’s helpful to review your current approach, find out where the key gaps are and the steps you will take to plug them. Your plan can then be presented in a prioritised roadmap of improvements. If you would like to find out more on the latest approaches to Digital Transformation, join over 200 marketers at the 2014 Smart Insights Digital Impact conference. As partners, we’re offering ClickThrough customers and readers of this blog a discount of 25% discount on attendance. Just enter discount code “digimpactpartner25” on the EventBrite registration page. The Digital Impact conference has separate practical case studies and workshops on making an impact across all the key digital marketing techniques from Strategy to Search, including Mobile, Email and Conversion Rate Optimisation. Phil Robinson, MD of ClickThrough Marketing will be leading the breakout workshop on SEO and content marketing.